Rome, 18 April 2018 (FAO)* – The body charged with keeping global trade in plants and plant products safe has adopted several new phytosanitary standards aimed at preventing destructive agricultural and environmental pests from jumping borders and spreading internationally. 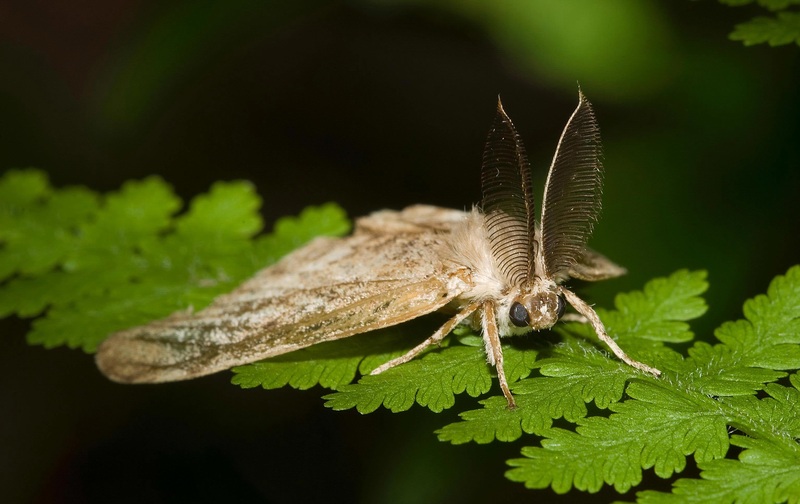 A male Gypsy Moth, a voracious tree pest capable of defoliating millions of acres of forest in a single year. |Source: FAO. The standardized norms developed by the International Plant Protection Convention (IPPC) cover a range of strategies and techniques used to prevent the introduction and spread of plant diseases and pests to new environments, thereby avoiding their often-devastating impacts on biodiversity, food security and trade. “This is challenging work with high stakes: each year an estimated 10-16 percent of our global harvest is lost to plant pests. A loss estimated at $220 billion”, FAO Deputy Director-General Maria Helena Semedo said at the opening of this year’s IPPC annual meeting in Rome. Some $1.1 trillion worth of agricultural products are traded internationally each year, with food accounting for over 80 percent of that total, according to FAO data. Standard on the use of various temperature treatments against agricultural pests. The standard aims at ensuring that such treatments are consistently and effectively used in different operational contexts. The norm covers cold treatment techniques that freeze and kill pests as well as those that raise temperatures past their survival threshold. This can be achieved by submerging them in extremely hot water or exposing them to super-heated steam (for commodities vulnerable to drying out, such as fruits, vegetables or flower bulbs) or dry heat (ideal for low moisture-content items such as seeds or grain). Revised standard for sanitation of wood packing materials. An existing standard, known as ISPM-15, was updated to include the use of sulphuryl fluoride — a gas insecticide — and new-generation heating technologies that employ microwave and radio frequency waves to generate pest-killing temperatures deep inside wood products. An expanded standard on the use of heat vapour to kill Oriental Fruit Flies. The highly destructive, fruit-attacking Bactrocera dorsalis originated in Asia but has now spread to at least 65 countries. Its presence in Africa, where it first appeared in 2003, costs the continent an estimated $2 billion in annual losses due to fruit export bans. The control technique outlined under the new measure kills 99.98 percent of the bug’s eggs and larvae when used correctly. The IPPC Commission also approved revisions that streamline existing standards targeting fruit flies to make it easier for countries to comply with them and improve their effectiveness, as well as revisions to a standard that establishes best-practice benchmarks for the operation of national pest surveillance programs. And it endorsed new diagnostic protocols for sudden oak death, a fungi-like organism of unknown origin that attacks a wide range of trees and shrubs in nurseries, introduced into western North America and western Europe through the ornamental plants trade. And it approved new diagnostic protocol for tospoviruses, which affect 1,000 plant species and are causing devastating losses, especially to tomato, potato and squash and cucumber yields. The dangerous hitchhikers carried by global trade — plant pests and diseases — once introduced into new environments can quickly take root and spread, impacting food production and causing billions in economic damages and control cost. One recent study in East Africa, for instance, found that just five invasive alien species could be causing as much as $1.1 billion in economic losses annually to smallholder farmers in the region. Not only can fruits, crops and seeds become infected, but the containers and boxes they travel in, as well. Packaging for overseas shipments is commonly constructed from wood, which is relatively inexpensive, and easily manufactured — but also easily infested with a variety of bark and wood pests, and so act as a vector. Timber and wood-made products like furniture can harbour stowaways, also. This means that not only are food crops at risk, but forests and trees as well. Recent studies shared during this week’s meeting have shown that the loss of tree cover due to invasive pests may result in an increase in stress related-diseases and possibly elevated human mortality rates. In another example, the Republic of Korea was recently forced to cut down some 3.5 million trees as a result of the pinewood nematode, and over the past three decades has spent nearly a half a billion dollars on control programs to fight this deadly pest. Additional sums have been spent in Canada and the United States in attempts to stop the thus far unstoppable Emerald Ash Borer. The need to contain threats such as these are why the IPPC was established in 1952. Since then, it has promulgated some 100 standards covering a broad range of phytosanitary issues. It also runs a number of programs that work to share information on best-practices and build the capacity of developing countries to manage plant diseases and pests, both at home and in trade flows.